It’s that time again, the end of the year and preparing to welcome in 2018 with a bang! Last year we were all about bright colors for the celebration, while this year we’re really feeling the gold love. 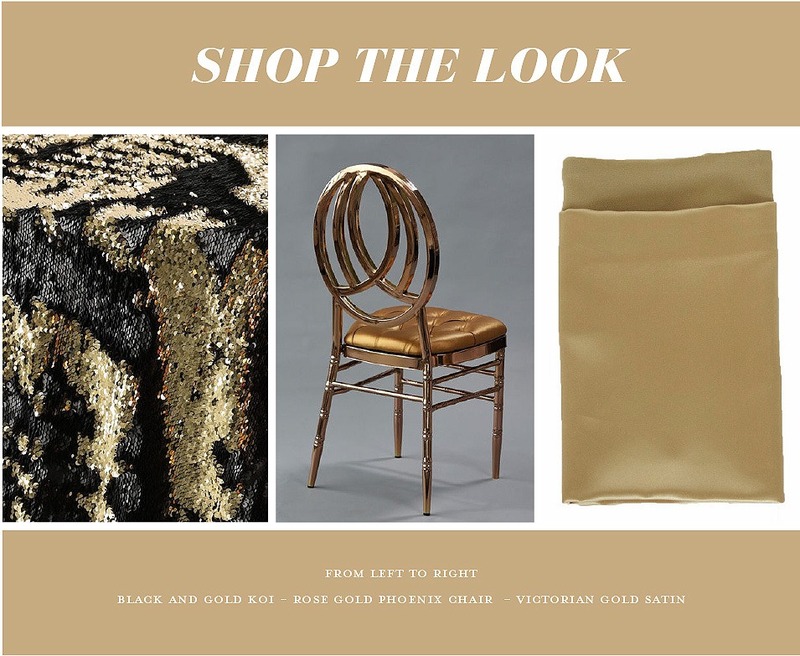 Anchor down those metallics with some luxe black details and we are ready to party! 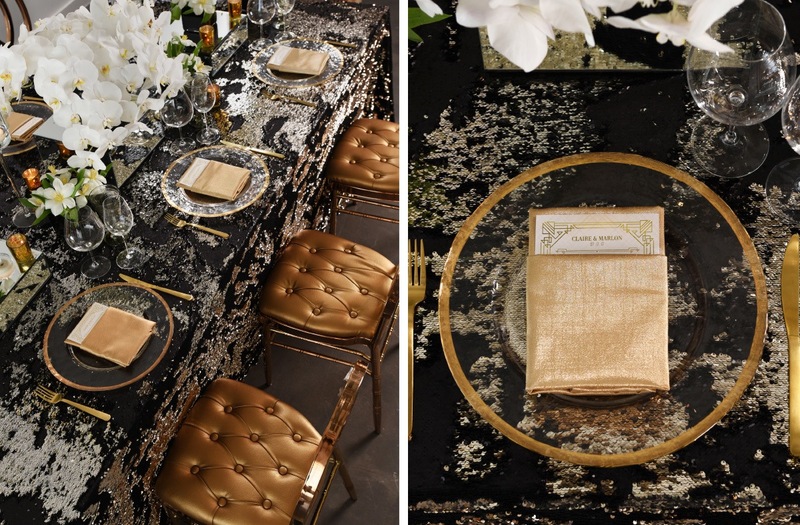 We worked with Rodri Studio on this lavishly elegant look, full of rich metallic and cascading orchids. 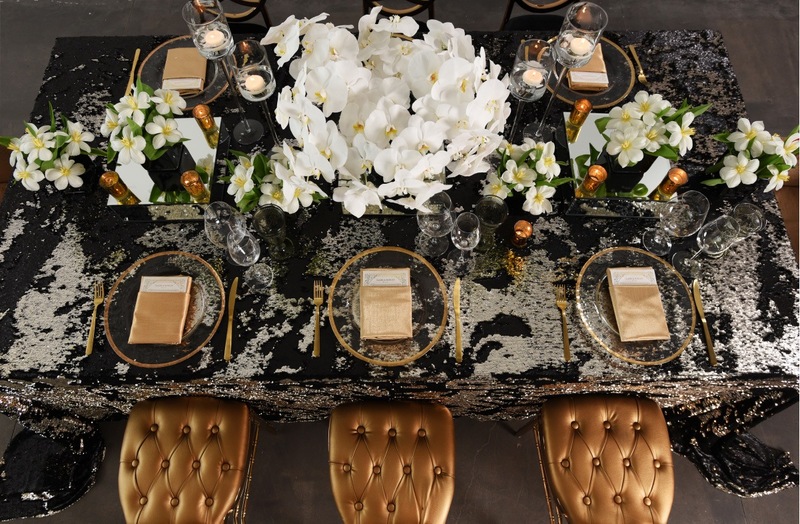 The table was set with our Black and Gold Koi linen giving us the perfect base to build this look on. Rodri Studio gave the tablescape a modern feel with square mirrored pedestals topped with minimal arrangements of white flowers, including a centerpiece of cascading white orchids. 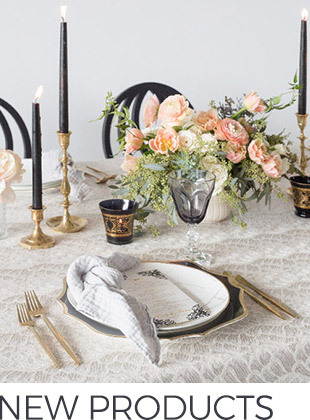 Keeping with our gold motif, we added in gilded tabletop accents such as our Clear Charger with Gold Rim and Stone Metallic Faux Dupioni Napkin paired with gold flatware. 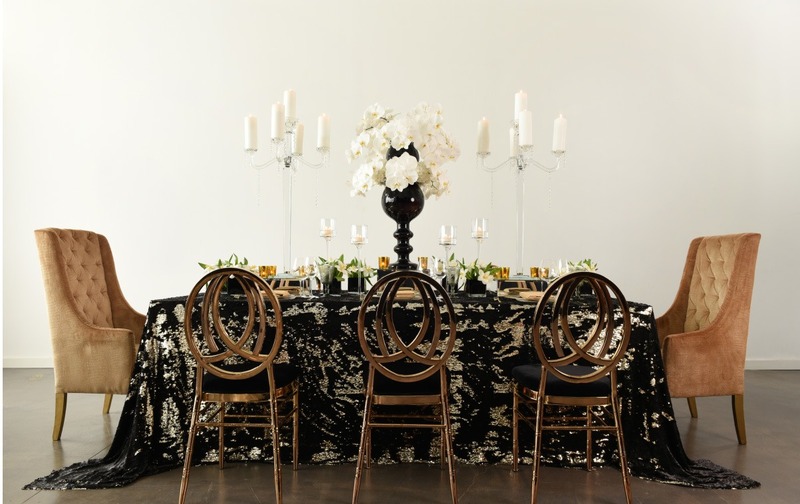 As for seating, mixing and matching two styles gave the table a fun added dimension! Our Rose Gold Phoenix Chair, an exclusive design, ran down the table with our Gold High Back Wing Chairs anchoring the ends. 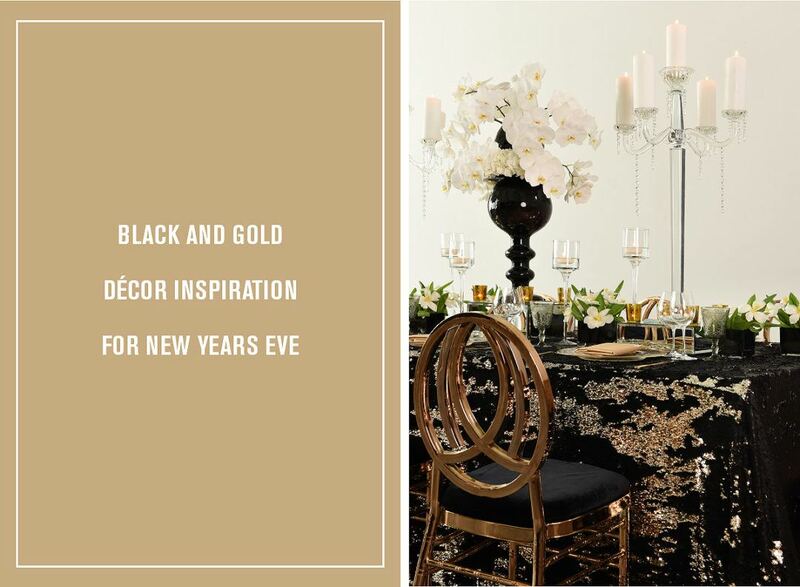 Combining a stellar sequin linen with simply chic décor, we think this table is just the place we want to ring in the new year! We kicked off the day checking in at the Pop Up Mercado where Gifts for the Good Life dreamed up the most incredible experience for picking up a locally curated selection of swag like hand-woven tote bags and Mexican-themed ornaments (we scooped up a Frida Khalo one!). Fast forward to Opening Session where we stepped into a room set for over 300 excited attendees! Our Pink Velluto dressed the tables for two days of back to back engaging speaker sessions. Each day we found new fun surprises at our seats, from Two Paper Dolls and Gifts for the Good Life, to help get our notes down. Monday night’s welcome party was a festive fiesta-themed party! We snacked on delicious dishes while taking in some custom entertainment from Elan Artists; think glitter face painting, Lucha Libre wrestlers and a brilliant fireworks display. Welcome to Engage!17! We went from general session to breakout sessions on Tuesday with a tropical lunch in between. We found the perfect place for an outdoor lunch at Nizuc’s Terra Nostra, where the tables were set in our Avocado Oxford, Petal Oxford and, introducing, our NEW Palm inspired linen (launching in 2018!). 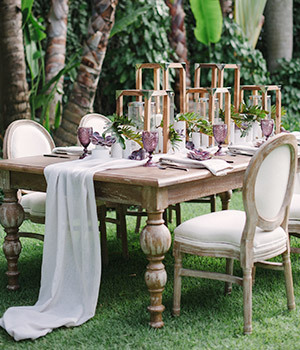 If you’re dreaming of summer weddings and brunches under the sun, this has just the vibe! As Dine Arounds rolled around, we enjoyed the diverse cuisines on site at Nizuc before heading to the poolside Dessert Party, not knowing what Elan Artists had in store for the night! As we walked through the lush path to desserts, performers in Dia de los Muertos-inspired attire lead us to the fun. We danced with skeletons, took in some face painting and snapped photos in front of a hand-painted mural photo booth. And the after party? An intimate speakeasy in Nizuc’s Havana Room with Elan Artist’s musicians setting just the mood. Before we knew it, Wednesday was here and it was countdown to the gala! We dropped in on breakout sessions all morning, from talks with Anja Winnika of The Knot to Sylvia Weinstock of Sylvia Weinstock Cakes, there was much to listen to and take in. And then there was the pool party! Hosted by Shutterfly, we kicked around in the water while enjoying poolside snacks paired with cool tequila palomas. Bringing more of the fun, Elan Artists had some synchronized swimmers in vintage-inspired garb to get the party started. Onto the gala, a celestial inspired event that was well beyond our dreams! We stepped into the ballroom as aerial acrobats danced to music performed by a full band on a stage that was just glowing in the space. Talk about making a first impression! 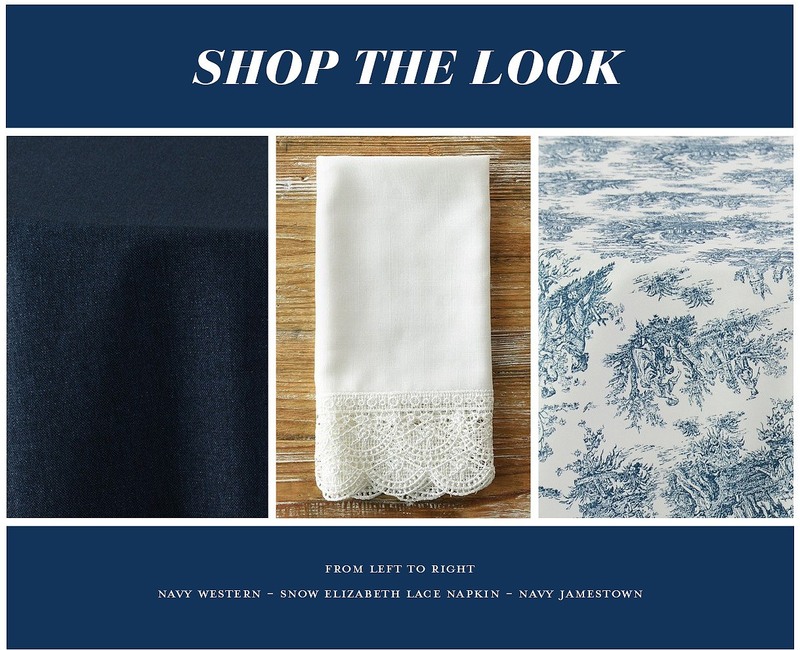 The room was set in an assortment of linens, from our Midnight Parker, to our Navy Sequin Taffeta and introducing our New Navy Lace Overlay (launching in 2018!). With galaxies projected on the walls, a constellation designed on the dance floor and performances coming down from the sky, it was truly out of this world! We woke up Thursday with our hearts full (and admittedly our feet tired – all that dancing!). 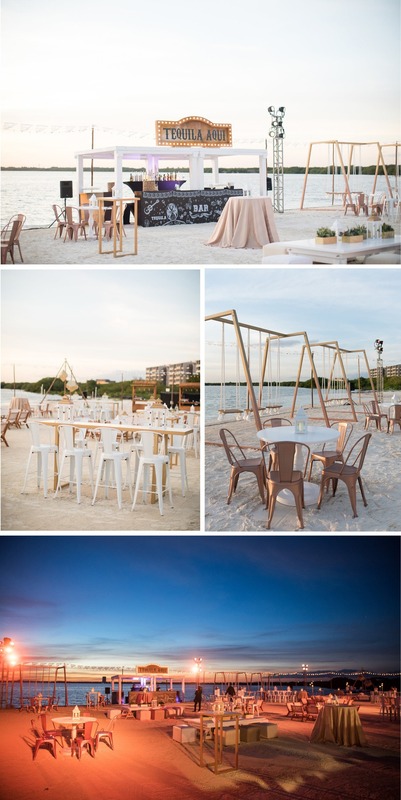 From meeting new friends, connecting with friends from across the world and watching the top wedding professionals come together to dream up another amazing Engage!, we can’t believe our stars. 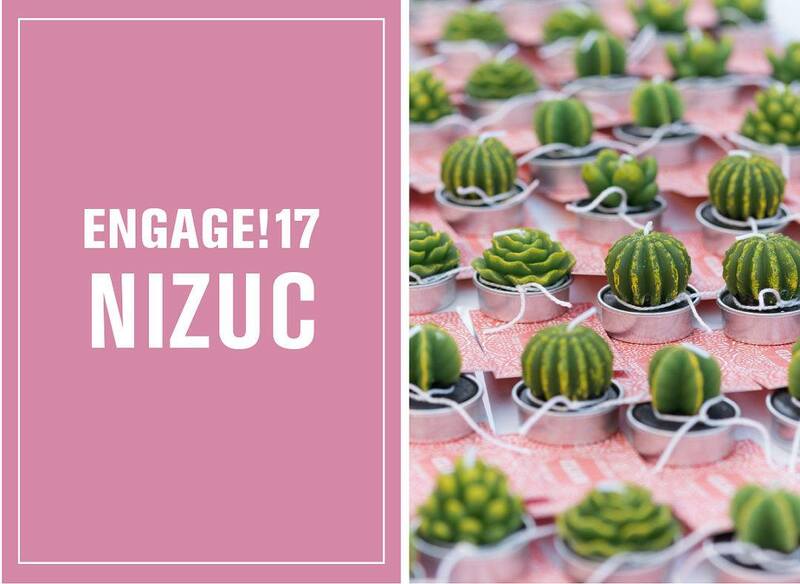 Will we be seeing you at any of the upcoming Engage!18 summits? 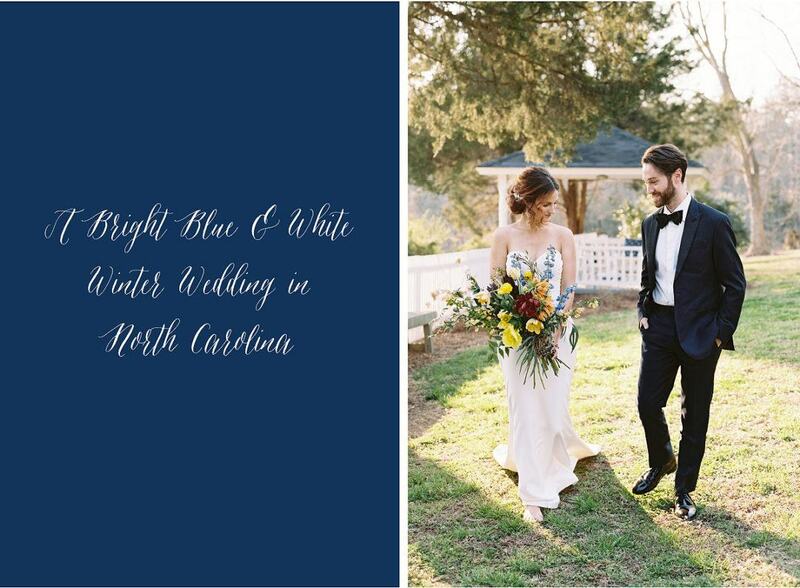 Henry Connor Bost House & Farm, in North Carolina, was the most gorgeous location for this shoot. With the feelings of fall in the air and the foliage turning all around, it just feels magical! 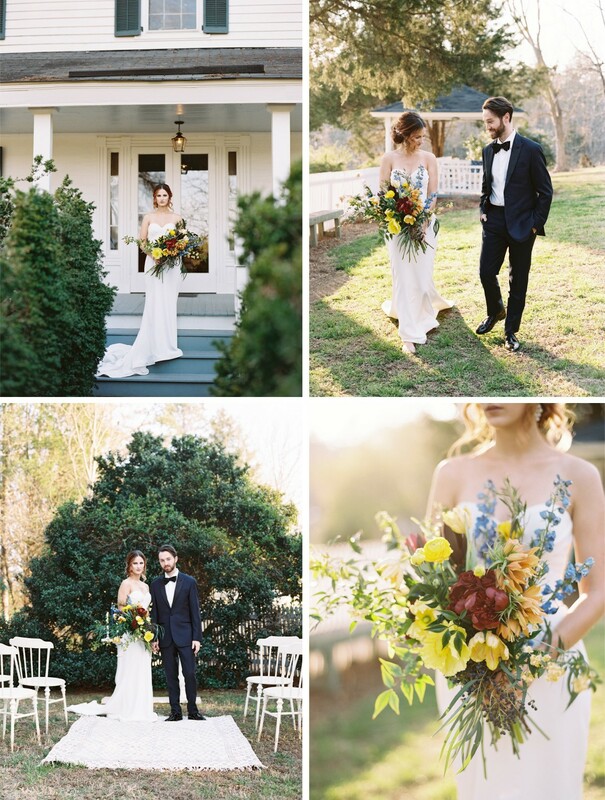 Moving between the house and the grounds for a small ceremony was the loveliest way to say “I Do! sunshine at just the right moment. 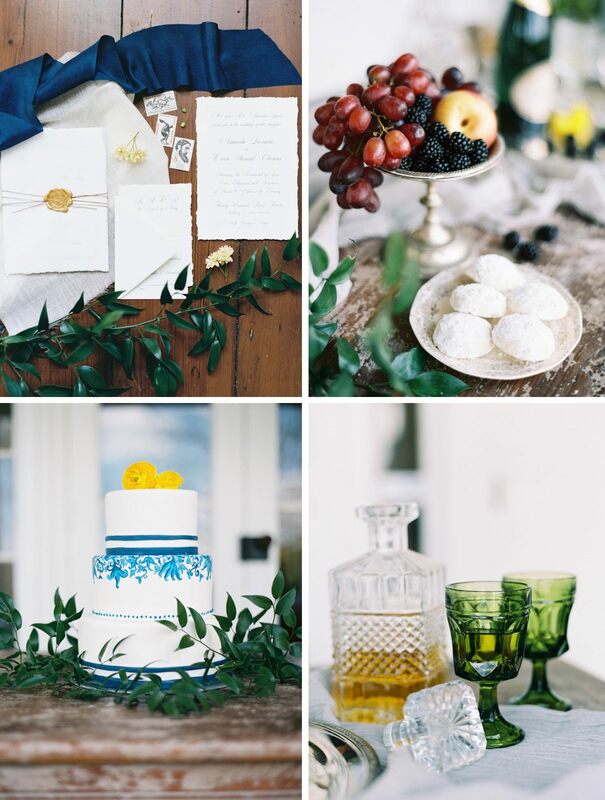 Set against our Navy Western linen, blue & white Chinoiserie plates, from Old South Vintage Rentals, popped to life with small gold ornate plated, from VTG VLT, to complement them. 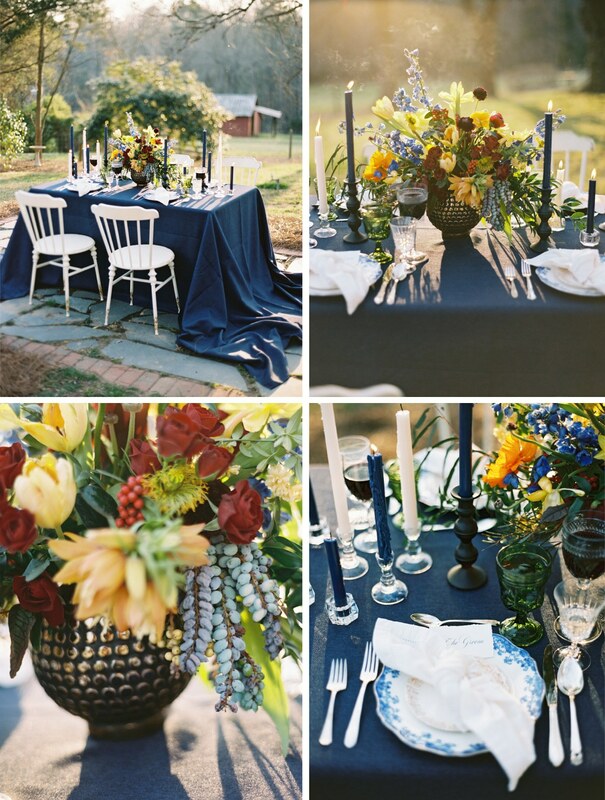 And in the center of the table, a primary-colored arrangement of flowers from Nectar gave the tablescape that bright pop of color. We love how taper candles, in blue and white, ran down the center in varied heights, like a runner. decorated with spirits and delicious fruit to accompany. Just the place to dine al fresco, which we love to do ourselves! Cheers to that! 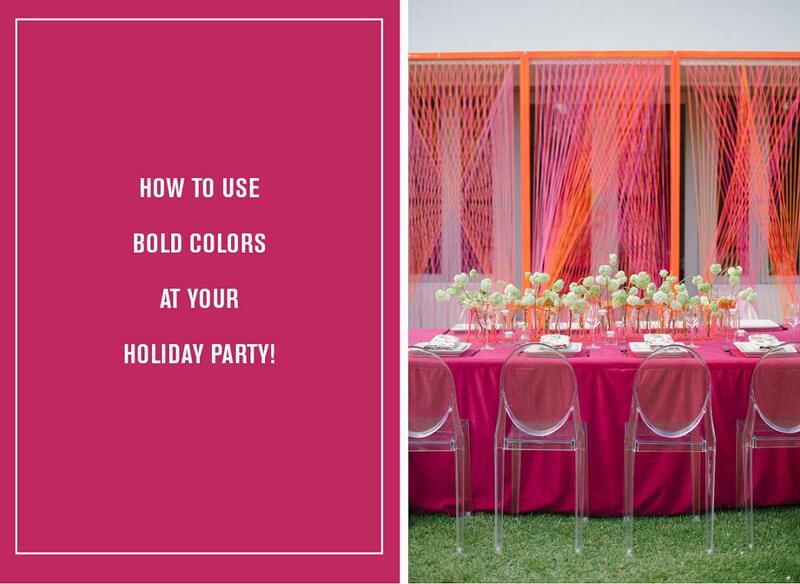 How to Use Bold Colors at your Holiday Party! 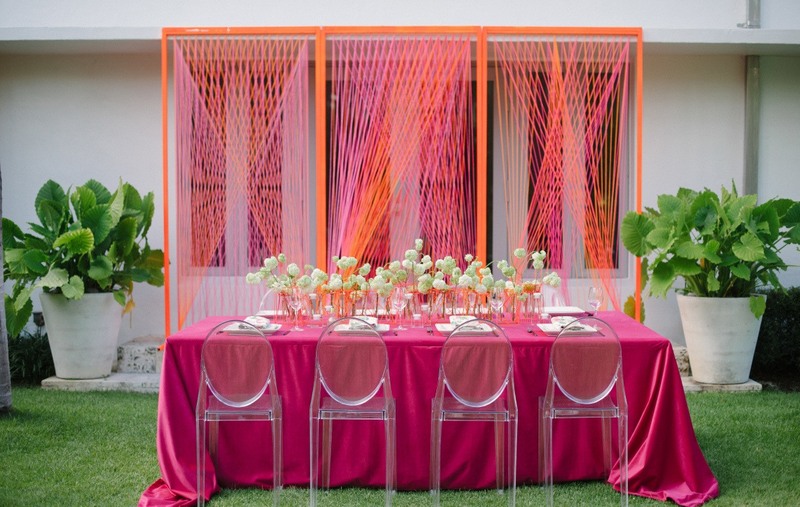 little pleasure is seeing parties that have gone all out on brilliant, bold colors! Don’t get us wrong; neutrals will always be our first love but what if we dared play with some bright color palettes? In your wildest dreams would you combine hot pink and vivid orange? 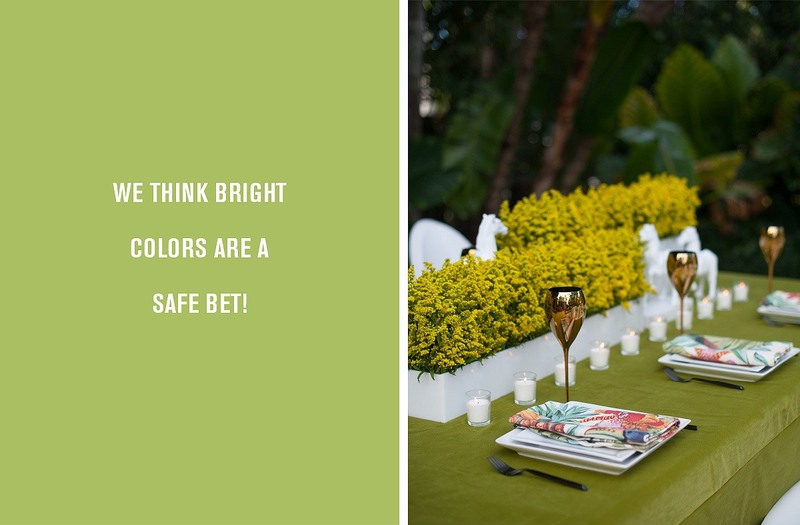 What about a cheerful yellow with chartreuse shades of green? 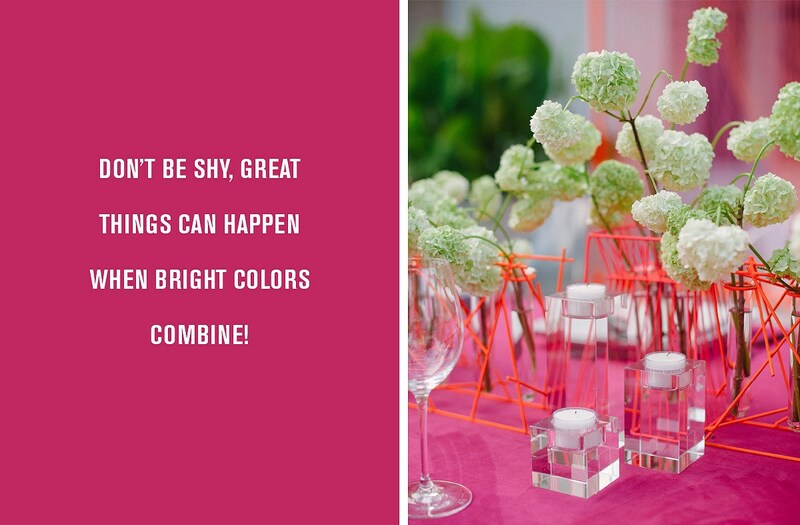 Don’t be shy, great things can happen when bright colors combine! Just scroll through to see more…. How about this – is it not the most incredible combination of bright pink and orange that you’ve ever seen?The details, all the way down to our Floral Monet napkin, bring this look together in a mutli-colored array of perfection. The Petal Productions team in Miami, FL, really set the bar high with this one! 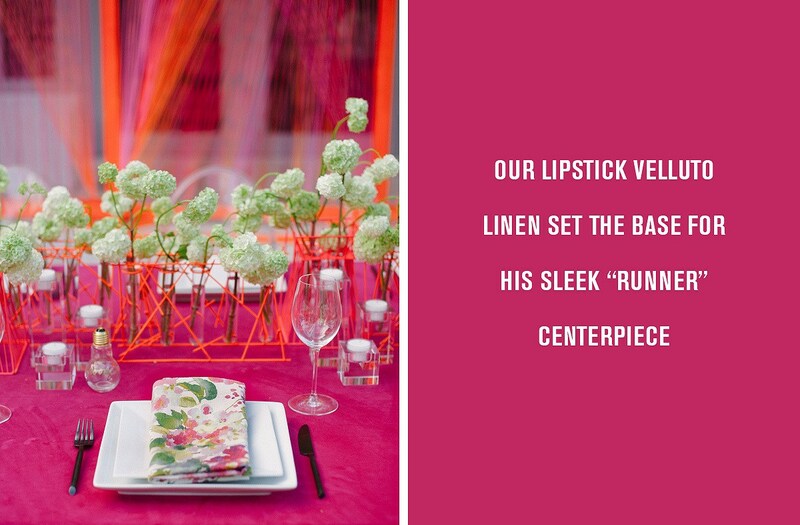 Our Lipstick Velluto linen set the base for his sleek “runner” centerpiece arrangement made up of geometric vases holding flowers in clear tubes, giving it the illusion of floating! We love how the linear pattern imitates the intricate woven backdrop too. corporate holiday party or double as a chic bat mitzvah look! If you’re looking for a more gentle transition to bright colors, how about mixing dainty yellow with shades of Greenery, Pantone’s 2017 Color of the Year? life a bold colored design offset with shiny optic white accents. The contrast of dainty yellow flower against their sharp white box vases works surprisingly well, especially when paired with those unique geometric horse statues in the style of Jonathan Adler. And of course, white acrylic Mirage chairs are the perfect touch for guest seating. 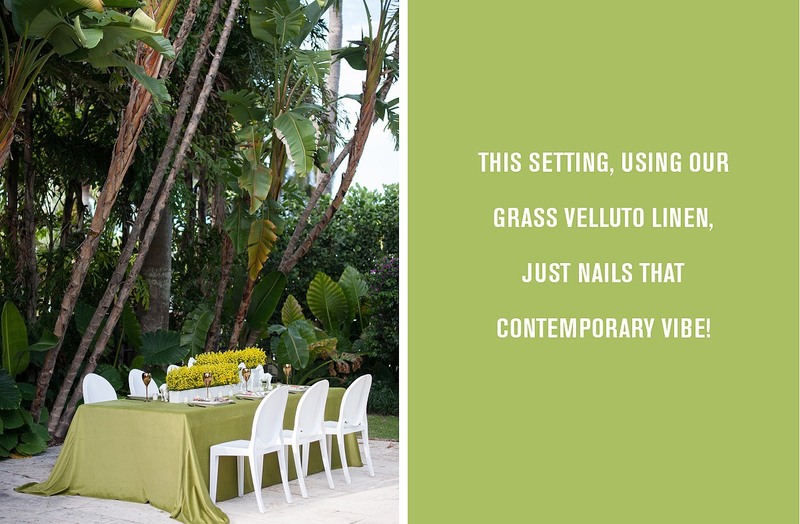 camouflaging right in for a dreamy outdoor wedding reception or a company retreat party! With so many colors and endless combinations, we think bright colors are a safe bet! And just for good measure, here’s one more time where bright colors made the party. Give it a try and let us know how it goes, we bet you’ll love it too!